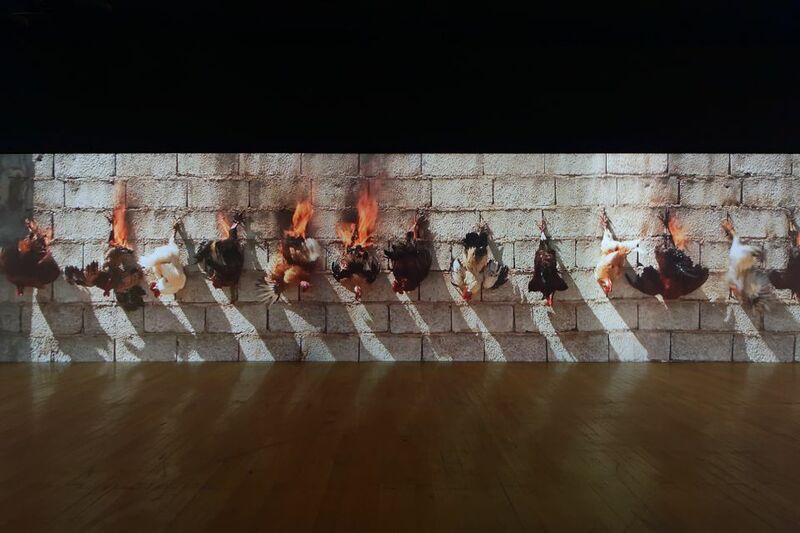 The Algerian, Paris-based artist Adel Abdessemed has withdrawn his video of chickens on fire from his exhibition at the MAC Lyon following an onslaught of criticism on social media networks. Titled Printemps (2013) and shown across three walls, the disturbing video shows a line of chickens hung on a wall, their legs tied, making jerking movements as their feathers are licked by flames. It was made in Morocco by a team of special effects technicians and, according to the museum’s press statement, the chickens “were subjected to the effect of flames only for three seconds and under the strict control of technicians and the artist to avoid any suffering”. Abdessemed describes Printemps as an “allegory of all violence”, particularly that inflicted on animals. A day after the L’antidote exhibition (9 March-8 July) opened last week, an animal rights activist slammed the work on Twitter, followed by more social media users over the weekend. Abdessemed and the MAC Lyon decided to withdraw the video from his exhibition on Wednesday 14 March. This is not the first time that the provocative artist has been condemned for using violence in his artworks. The San Francisco Art Institute cancelled his Don’t Trust Me exhibition in 2008 after visitors complained about six looped videos of animals being slaughtered with a sledgehammer. His sculpture Coup de tête (Headbutt), of footballer player Zinédine Zidane headbutting Marco Materazzi, was withdrawn from his exhibition at the Mathaf in Doha in 2013.